When I first began my journey to simplifying my life, the amount of stuff in my home totally overwhelmed me. 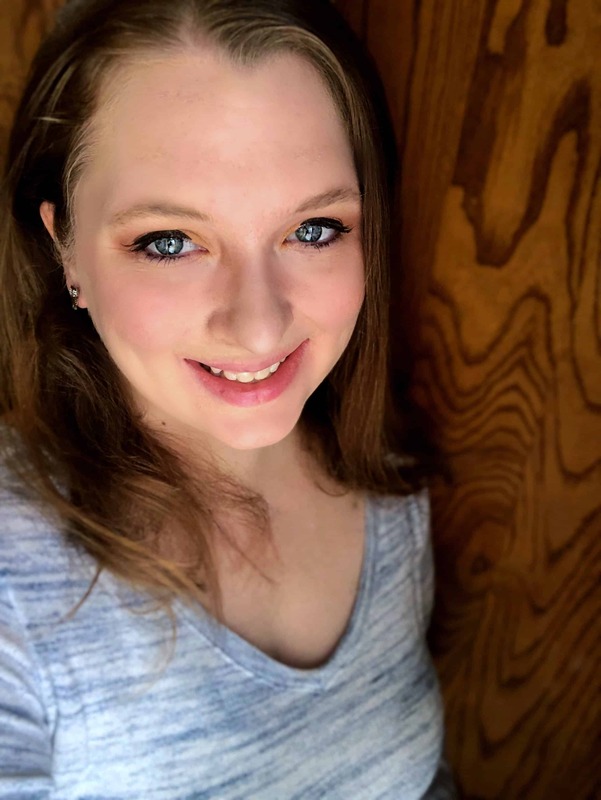 Now that I have five kids, I find that even with regular decluttering I often feel overwhelmed. Stuff has a way of creeping in. I’ve said it before, decluttering is a process when you are trying to figure out how to declutter your home. When everything has a place not only is it much easier to find what you’re looking for, but you can breathe a sigh of relief in a clear and clutter-free room. Clutter for me creates anxiety, so decluttering is a natural anti-anxiety method for me and I like to use a decluttering checklist. If you’re serious about decluttering, but feel overhwhelmed, take a step back and think about what is holding you back. Do you feel like you don’t have enough time? Do you not have enough energy? Do you feel like you need to keep things for sentimental reasons? Whatever it is that is holding you back, let it go and just start. 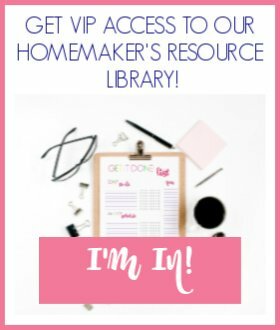 I personally recommend spending about a week or so working on totally decluttering your home. Go room by room and space by space and get rid of all of the things you no longer need. Continue to organize the things that you want to keep. The last space we worked on organizing was our medicine cabinet. Our medicine cabinet is in the kitchen and it was overflowing with all sorts of things. We didn’t even know what was up there. Mr. Simple went through all of the meds and disposed of the ones that were expired, then he grouped all like meds together. I used old storage bowls to organize the like meds in one spot. So, if we need medicine for the kids, I know which bowl it is in and I can just reach in and pull that one bowl out. I can’t tell you how long I put off organizing that medicine cabinet. It just kept getting worse and worse, but with my helper we were able to get in and tackle it! 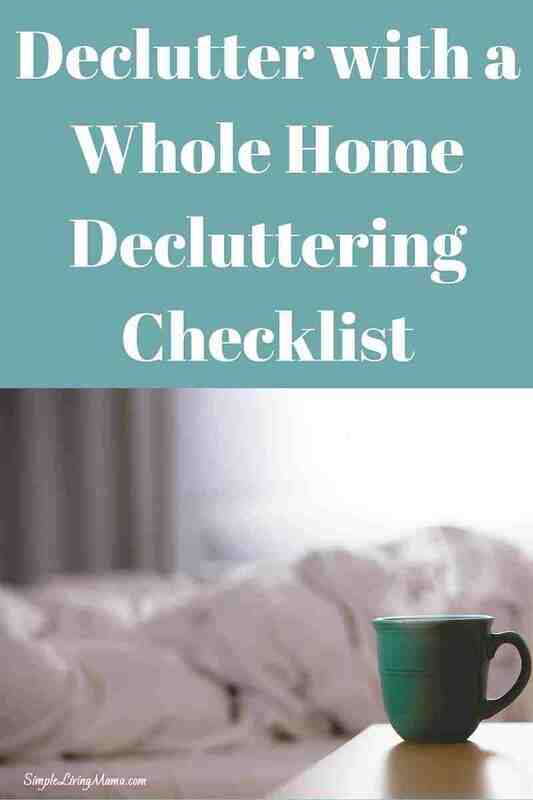 After creating my post on how to declutter your whole house, I thought it would be a great idea to create a whole home decluttering checklist. I tried to think of all of the spots and things that would need decluttering in a home and organized them by room. 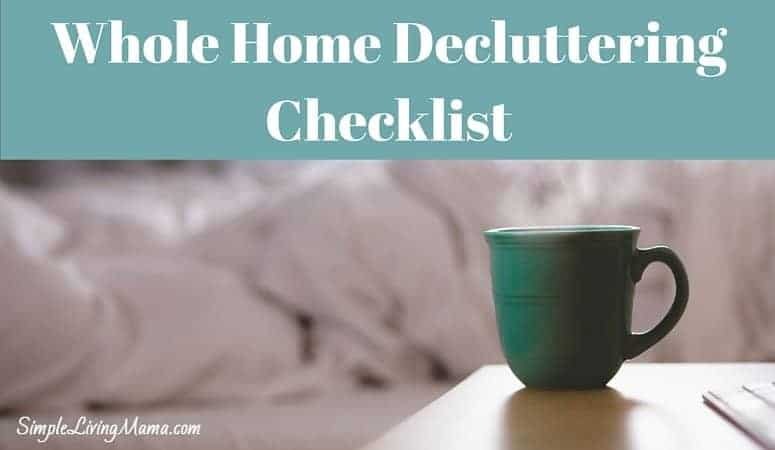 My newsletter subscribers can download the whole home decluttering checklist for free. Just mark off each item after you get it accomplished! I need a decluttering check list as well.. So many things to clear in my house..